Discovery: When sending out an email from the ACP >> General >>Mass Email/PM, if the user or recipient has HTML turned off, they receive the html codes along with the email message. Solutions Tried: ACP>>Configurations>>Icy Phoenix>>HTML Email>>NO. 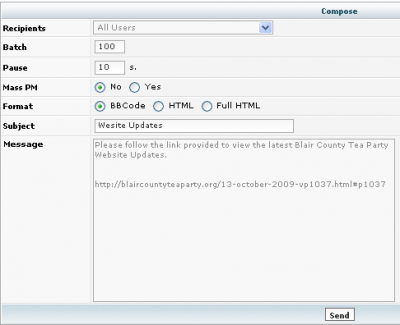 However, the user still gets some HTML Codes displayed. Results: The same except it doe not have as much HTML. Question 1: Have I missed something? Question 2: Can this be prevented? Question 3: Is there a work around? Please post here an example of the text you are sending, and the options you did set in ACP => Mass Email before ending it. Try to send the same text by selecting HTML and let me know if the result is the same. Thank you. It produced the following email without the html codes. 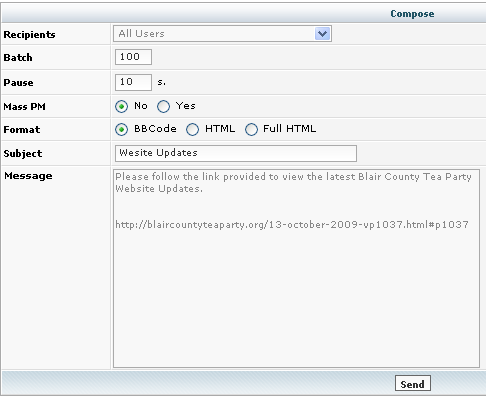 Please follow the link provided to view the latest Blair County Tea Party Website Updates. So this solved your problem? From the looks of it, yes. I guess I was confused or something. I was under the impression that bbcode meant that html would not be displayed. Not sure why it solved it though. I will be sending out another mass email today so I'll let you know if anything changes.